Stephen Hawking gave his usual annual talk at Caltech this week. The Caltech Alumni Association had a lottery to get reserved seating for the event. Sadly I did not win the lottery, and I was too lazy to camp outside of the auditorium and try to get into general admission. The LA Times reports his answers to student questions. I below is his answer to a question about the end of the world scenario in the collider experiment being carried out this summer in Geneva which I wrote about earlier. If black holes are created in the Large Hadron Collider, will we be in danger of getting eaten up by them? The LHC is absolutely safe. There is no danger that collisions between particles at the LHC will cause a rip in space-time and destroy the universe. Particles from collisions far greater than those in the LHC occur all the time in cosmic rays, but nothing terrible happens. After his talk, Hawking was wheeled out of Beckman Auditorium to a standing ovation. He then took a victory lap in his wheelchair around the building, while the crowd snapped pictures and shouted: "We love you, Stephen." Truly Hawking has gained super star status with the general public. Go read some of his books. One more before I go to sleep. The Electronic Frontier Foundation (EFF) is a great a organization. When I am a rich lawyer I will donate a lot of money to them. This is a group of lawyers who oppose major companies (sometimes even the government) in cases dealing with personal rights and technology. In the past the have fought against printer manufacturers abusing the DMCA to force consumers to purchase ink cartridges only from them, and sued various corporations for helping the NSA conduct warrantless surveillance. Most recently they are trying to preserve right of "First Sale." This right is what allows us to do whatever we want with the things we purchase, regardless of the copyright protecting the item. For example, I can burn a copyrighted book, or sell it to somebody else, or just throw it away as long as I buy it first. The copyright owner is only able to limit the "first sale" of the work. In this case, a record company is trying to stop sales of "Promotional Only" CD's on eBay. The record company argues that CDs that are mailed for promotional purposes are only licensed to the recipients, and therefore copyright holders never convey ownership rights of the CD to the recipient. This means that record companies can limit any subsequent sales, the first sale doctrine does not apply. On the other hand, the EFF argues that the record companies send these CDs as unsolicited gifts via mail (there is a lot of case law about this), and therefore the recipient is the legal owner of the CD and able to sell it if he wants. The EFF further describes a slippery slope where books and CDs, books and DVDs would not be subject to fair use after a copyright owner slaps a sticker with a user license. As ArsTechnica points out the court filing is a good read if only for the fact that it starts with a Harry Potter quote. Wow, I'm quiet for a few days then posting just start flowing from me. Reuters is reporting that "mogul 50 Cent, Universal Music Group and several of its record labels were sued on Wednesday for promoting a "gangsta lifestyle" by a 14-year-old boy who says friends of the rapper assaulted him." "The members of G-Unit [excuse me, G-G-G-Unit!] , including defendants Yayo and 50 Cent, encouraged, sanctioned, approved and condoned its members threatening violence, and or engaging in violent acts in furtherance of its business," the lawsuit said. The attack on Rosemond was intended to "promote and maintain Yayo and 50 Cent's 'gangsta' image," which was "promoted, marketed and advertised" by record labels. Yeah, ok. Much of this lawsuit should be dismissed. This seems like a simple assault and battery case. Like any other civil suit, prove that the defendants hurt you and calculate damages (hospital bills, lost wages etc.). Greedy lawyers might even try to old intentional infliction of emotional distress. Yet, this wasn't enough for this lawyer. He also wanted to sue the record labels to get more money. I am assuming he is claiming some sort of unjust enrichment claim, which is pretty bogus. The enrichment (sales of more gangsta records) was not done to the detriment of the plaintiff. I don't think nation wide sales are going to be affected just because your favorite rapper (or rap crew) beat up a 14-year old. They also better not be trying an accomplice or conspirator theory. I am pretty sure that the record companies did not enter an agreement to beat up the kid. These companies have lawyers who make sure nothing the executives do can be construed as promoting specific acts of violence. Glorifying violence in general should not be the basis of a lawsuit. Violence in movies and music does not beget violence, stupid people with pre-existing violent tendencies who watch TV and listen to music beget violence. Don't blame the media, blame stupid people. I love humming birds! 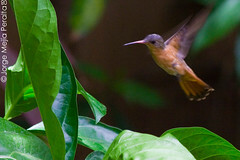 This photo is from a Nicaraguan photographer (hence the Spanish colibri=humming bird). I subscribe to his Flickr photo stream. Check out the rest of his pictures for views of my native land. GEEK/NERD WARNING!!!! THE FOLLOWING POST WILL EXPOSE YOU TO UNHEALTHY LEVELS OF GEEKDOM, CONTINUE READING AT YOUR OWN RISK. A patent attorney filed a patent application with the PTO claiming a new method for marriage proposal. The lawyer basically presented his girlfriend with a patent application as a way to ask her to marry him. This is way better than paying thousands of dollars to have your marriage proposal put up on the scoreboard of a baseball game. "The purpose of this invention is to provide an improved method of proposing marriage to an individual. The method of proposing to an individual generally comprising the steps of meeting the individual; exchanging names with the individual; dating the individual (not necessary); drafting a government document having a proposal to marry the individual incorporated therein; and showing the government document to the individual. The government document may be a patent application. The patent application may claim the method by which the proposor will make a marriage proposal to the individual. The proposor could then use the method claimed in the patent application to propose to the individual. The patent application could be the actual marriage proposal." Below is also the technical drawing for the marriage proposal. I seem to have some problems with step 16. Somebody should file a method improvement patent for this step. Even though not necessary to the method of the present invention, the method might include a dating step having at least one substantially unromantic first date at a bar where the individual works. The substantially unromantic first date could also include the individual inviting a friend from Chicago, Ill., on the unromantic first date. Along with the first date, the dating step might include a plurality of dates. One such date might include a trip to Savannah, Ga. Other such dates could include a trip from Omaha, Nebr., to Kansas City, Mo., or a trip from Omaha, Nebr., to Nassau in the Bahamas. In the event that the proposor and the individual desire to remain in Omaha, Nebr., on one of the plurality of dates, the proposor, preferably, asks the individual on such a date at least one week in advance. The proposor might also open the door of a vehicle for the individual or give the individual flowers while on such a date. Furthermore, at least one claim of the patent application may specifically recite "Ellie, if you will marry me, after reading the remainder of this patent application, open the second envelope and tell the limousine driver to take you to the airport." In the best mode of this invention, Ellie tells the limousine driver to drive to the airport. Ryan should conceal a diamond ring in one of his pockets while waiting at the airport for Ellie. Upon Ellie's arrival, Ryan should present Ellie with the diamond ring. Overall I think this is awesome, I wish I could of come up with the idea first. I'm sure this will never get accepted as a patent, but it looks like it was fun to write. Check out the links below to also see a wedding program in the form of a patent application. Back in the day, a couple of Caltech students decided that they wanted to publish a comic that depicted Caltech undergraduate life. They named their new strip Crippling Depression. You should check out their site. Many of the jokes are inside jokes, meaning only those who suffered through Caltech will get it. I was browsing through the site and found the comic below, it really describes how I feel right now on so many levels. UPDATE: My blog template won't display images this wide, just click on the image above.